Oh this child. I was just going to wax poetically about how awesome she is. Funny and smart and scary quick. About how we can spend hours playing Uno and laugh until we cry. 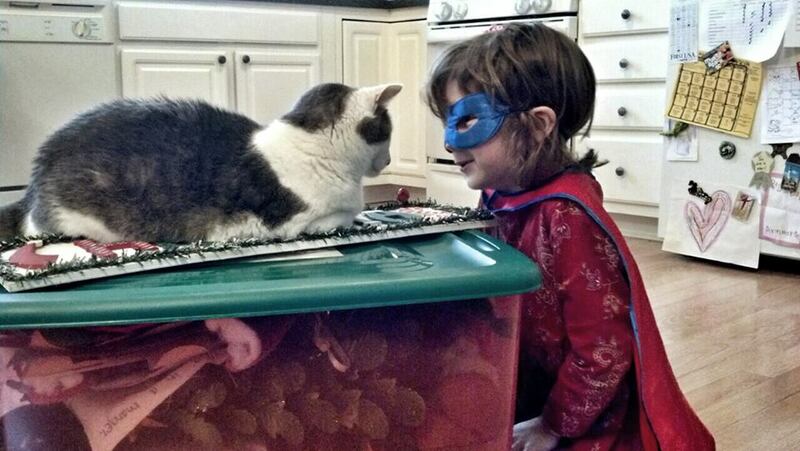 About how you never, ever have any idea what she’s going to do next- like dress up like a super hero and stop in her travels to love up on the cat as we finally packed away Christmas 2013. But then she just fought me like a demon about going to bed (I’m so hungry. I’m thirty. Sit in my bedroom. You’re the Meanest Mom EVER). Life with the Bean is so many things, but it’s never boring. She makes me stronger and better and quicker- more loving and enthusiastic and patient. And tired- so very tired. And I wouldn’t trade her for anything 99.9% of the time! “Life with the Bean is so many things, but it’s never boring. She makes me stronger and better and quicker- more loving and enthusiastic and patient. And tired- so very tired. And I wouldn’t trade her for anything 99.9% of the time!” – Great words! If I just switched out the name “Bean” for “Pookie” it would describe my life with my daughter exactly.